Tomkat has quite a selection of beautiful cake stands! This is one of my go-to packaging stores. Bakers will love these beautiful paper cupcake wrappers! How incredible are the cutting boards at Elysium? I'm in love! I got these measuring cups for my birthday and love them! Bonus: they're dishwasher and microwave safe as well. I bought one of these for one of my best friend's birthdays this year. It's pretty cool - you can pick custom pattern and text. So cute! Great for anyone who likes to bake (esp. if they often give baked goods away). These pretty bottles are perfect for storing homemade flavored oils or vinegars, among other things. I own a copy of Lindsay's cookbook (though I'm so lazy I haven't tried any recipes yet). I can tell you there are some pretty amazing-looking recipes in it. Definitely good for anyone whose fondest memories include sneaking raw cookie dough. Pretty much anything Le Creuset is going to be a win for chefs and bakers. These pretty ramekins come in several different colors. A set of these would make a great gift for winter, when warm dishes and desserts from the oven sound especially tasty. I received this vegetarian cookbook for my birthday this year and love it! I especially appreciate the way Clotilde has organized it (by season) and the vegetable chart, which tells you how long each vegetable generally lasts before spoiling. Good for someone who likes to prepare fancier meals. This is another vegetarian cookbook I received for my birthday. Erin's cookbook is awesome because every single dish is super simple! I think most of the dishes have under five ingredients and the dishes do not shy away from calling for pre-made ingredients like pie crust. It's great for anyone who likes to cook simple, practical meals without having to feel guilty for not making everything from scratch. I can also tell you that even though there are so few ingredients required, there are definitely a lot of brilliant ingredient combinations that I hadn't thought of previously. Every month, the Hatchery's chefs select a variety of artisan agreements and ship them to subscription recipients, along with recipe suggestions. Great for anyone who likes cooking with new, fancy ingredients! Also available in 6 & 12-month subscriptions. I love those whale measuring cups and that cute apron!! The whales make me smile every time I use them! 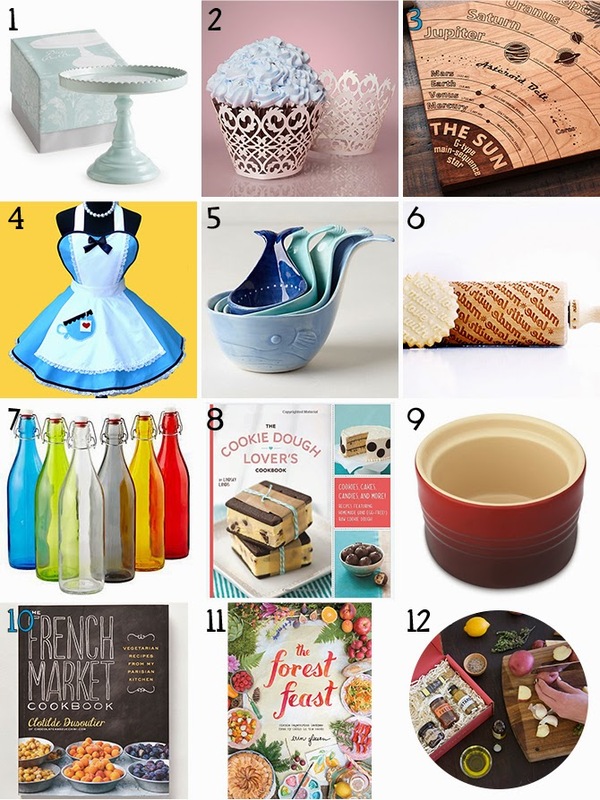 It's killing me looking at your gift guide, never mind buying for other people, I want pretty much everything on here (especially that beautiful blue cake stand even though I have too many already and the Forest Feast and whale measuring cups)! Haha Emma, you have no idea how hard it was to make these lists... for the same reason! I ended up ordering a few things off the nail enthusiast gift guide because they're small, so I didn't feel quite as guilty... heh. I'm a little behind in my blog reading, but I have to say—your gift guides were spectacular! What an awesome eye you have. I really enjoyed looking through them all, even if it's probably a little too late to snag anything off of them ... this year. Aww, thanks, Mandy! :) Heh yeah I know what you mean - that's one downside to online ordering (though I almost exclusively order things online). The time it takes to arrive! I do a lot of online ordering as well. I kind of hate shopping in crowds, and the crowds only get worse this time of year!